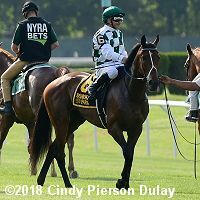 The Belmont Stakes Racing Festival runs from Thursday to Saturday, highlighted by the 150th Belmont Stakes run on Saturday. Friday afternoon's card included 5 stakes (4 graded), contested under mostly sunny skies and temperatures in the upper 70's, with a fast main track and firm turf courses. 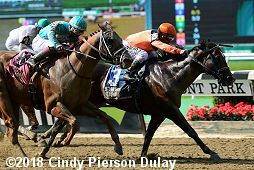 The $600,000 New York Stakes (G2) featured a field of 9 older fillies and mares going 1 1/4 miles on the inner turf. 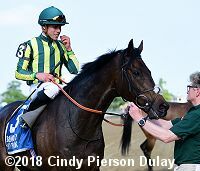 Jenny Wiley (G1) winner Sistercharlie was sent off as the 1-2 favorite over 9-2 Fourstar Crook, winner of the Hillsborough (G2) before finishing 2nd in the Jenny Wiley, and 8-1 Holy Helena, last year's Queen's Plate winner exiting wins in The Very One (G3) at Gulfstream and the Sheepshead Bay (G2) at Belmont. 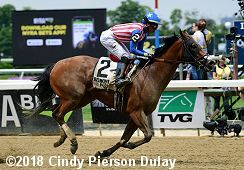 Jockey Edwin Maldonado sent 16-1 Fahan Mura to an uncontested lead of as many as 8 1/2 lengths through fractions of 23.12, 46.39, 1:10.36, and 1:34.86 while stalked by 46-1 Esquisse, in turn 15 lengths in front of 45-1 Snowy Winter. Entering the stretch, Fahan Mura still led through 9f in 1:47.54 but tired late. Fourstar Crook, 6th early under Irad Ortiz, Jr., came out 5 wide and outfinished fast closing favorite Sistercharlie to win by a head in 1:59.21. It was another 1 1/4 lengths back to 9-1 Daddys Lil Darling third. Left: Fourstar Crook in the winner's circle. Winning jockey Irad Ortiz Jr. said, "The speed horses opened up way too much, so I didn't pay attention to that. I just rode my filly. She was comfortable, so I didn't try to do anything crazy. I kept her covered up, saving ground, like the owner and Chad wanted. I just rode my filly and she was there. I kept riding her and she held on. Sistercharlie was flying, but she held on." 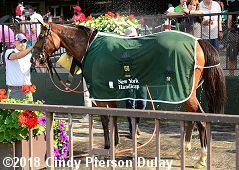 Right: Fourstar Crook get hosed off after the race. Left: Second place finisher and beaten favorite Sistercharlie returns after the race. 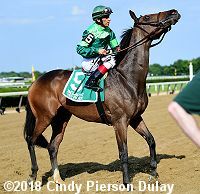 Chad Brown, trainer of winner Fourstar Crook and runner-up Sistercharlie said, "Sistercharlie really had a nightmare trip. [She] walked out of the gate, looked like she was making a move up the inside at the 3/8 pole and then got steadied, moved back, then for her to make a run again and to only get beaten by a head, she really ran a remarkable race. Disappointing to see her getting knocked out of position after her run at Keeneland, where I thought she was very vulnerable at 1 1/16 miles and so tactical. Kind of weird to see her run her race all strung out. [The result was] disappointing, but her effort wasn't." Right: Third place finisher Daddys Lil Darling behind the starting gate. 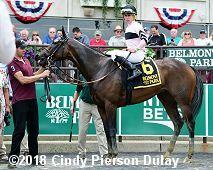 The Ken McPeek trainee improved her record to 4 wins, 6 seconds, and 2 thirds in 18 starts, earning $1,250,405 for owner-breeder Normandy Farm. The $250,000 True North Stakes (G2) featured a field of 6 older horses sprinting 6 1/2 furlongs on the main track. Breeders' Cup Sprint (G1) runner-up Imperial Hint was sent off as the 8-5 favorite over 5-2 Whitmore, winner of the Count Fleet Sprint (G3) but 4th in the Churchill Downs Stakes (G2), and 11-4 Bobby Abu Dhabi, winner of the Kona Gold (G2). 8-1 Recruiting Ready set the pace of 21.85 and 44.52 under Mike Smith while pressed by Bobby Abu Dhabi and stalked by Imperial Hint. Turning for home Recruiting Ready tired as Imperial Hint took over the front 3 wide. Whitmore, last early, put in a strong 4 wide rally but Imperial Hint and jockey Javier Castellano held him off by a neck in 1:15.02. It was another 1 1/2 lengths back to Bobby Abu Dhabi third. Left: Imperial Hint in the winner's circle. Winning trainer Luis Carvajal, Jr. said, "He's a really fast horse. Javier won the Smile [Sprint at Gulfstream Park] and he took him back a little bit. This morning when I talked to Javier, he said I think I want to take him back let him relax a little bit. Javier is a professional. He rode him perfect. Everything went perfect, to plan." Right: Imperial Hint heads out of the paddock before the race. Winning jockey Javier Castellano said, "It worked out perfect. The two horses went to the lead and there were very fast fractions. It worked out great, it was a perfect trip. That's what I was looking for today. Usually, I feel like this horse is always on the lead, and the last sixteenth, he's always - eh, but today it worked out great. I asked him and he broke again. He's a nice horse." Left: Second place finisher Whitmore in the post parade. 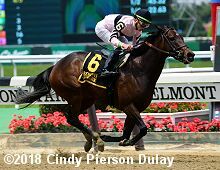 Laura Moquett, assistant to trainer Ron Moquett, said, "I thought he ran a lovely race. It was great. I wish the outcome would have been a little different. I'm so happy with him. I can't wait for the rest of the season." Right: Third place finisher Bobby Abu Dhabi in the post parade. 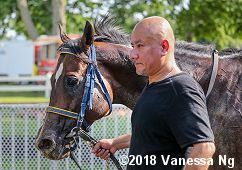 The Peter Miller trainee improved his record to 4 wins, 2 seconds, and 1 third in 9 starts, earning $375,100 for owners Rockingham Ranch and David Bernsen. 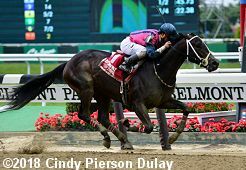 Closing out the Friday stakes action, the $400,000 Belmont Gold Cup Invitational (G2) featured a field of 8 older horses going 2 miles around 3 turns of the Widener turf. Call to Mind was sent off as the 9-5 favorite off a third place finish in the Yorkshire Cup (G2) over 7-2 Funny Kid, winner of the Prix de Barbeville (G2), and 9-2 Nessy, winner of the San Juan Capistrano (G3). 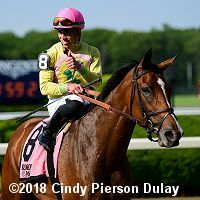 Jockey Florent Geroux sent 11-1 Postulation to lead through fractions of 50.74, 1:40.49, 2:04.10, and 2:29.61 over the firm going while pressed by Call to Mind and stalked by 10-1 Prince of Arran. At the top of the lane Postulation tired allowing Call to Mind to inherit the lead through 1 3/4 in 2:53.63. Kept to task by Javier Castellano, Call to Mind easily held off late-running 7-1 Canessar by a length in a new course record 3:16.78. It was a neck back to Prince of Arran third. Left: A very sweaty Call to Mind in the winner's circle. 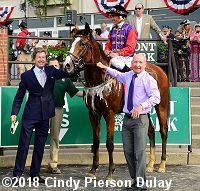 John Warren, racing manager for winning owner Her Majesty Queen Elizabeth, said, "We knew this was the kindest track in America, being such a lovely turf course and so well looked after. That was always the focus of the mind, to make sure to look after the horse to make sure he was going to run over a good track. He's a horse at home that fits in a Group 2-level caliber and there aren't many Group 2-level races written. When looking over the program, this was the perfect race." Right: Call to Mind heads back to the barn after the race. Left: Second place finisher Canessar returns after the race. Jockey Feargal Lynch said, "He just got a bit squeezed there coming out of the gate. Cost me a position where I didn't want to be that far back. But we saved a lot of ground. He made a nice run in the straight. The European horse just had a little more kick in the end. "He stays well. There's never been a doubt this horse is a stayer. All he does is gallop, gallop, gallop. He's a nice horse. He's a nice horse. He ran a big race today. I was expecting a big run from him today. I was expecting a one, two or three." Right: Third place finisher Prince of Arran returns after the race. The Charlie Fellowes trainee improved his record to 4 wins, 5 seconds and 2 thirds in 25 starts, earning $239,552 for owner-breeder Rabbah Bloodstock Limited. 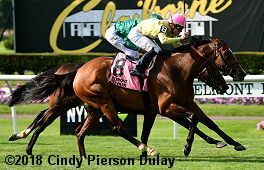 The first stakes race on Friday was the $250,000 Bed o'Roses Invitational (G3) for older fillies and mares sprinting 7 furlongs on the main track. 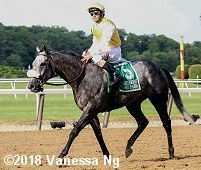 Humana Distaff (G1) winner American Gal was the 9-10 favorite in the field of 5 over 3-1 Lewis Bay, 3rd in the Humana, and 3-1 Divine Miss Grey, 3rd in the Distaff Handicap (G3). Jockey Kendrick Carmouche sent Divine Miss Grey to lead through fractions of 22.63 and 45.32 while pressed by Lewis Bay and stalked by American Gal. Turning for home American Gal tired as Lewis Bay took over through 3/4 in 1:08.68. Kept to task by Irad Ortiz Jr., Lewis Bay drew off to win by 5 1/2 lengths over 11-2 Highway Star in 1:21.11. It was 1 1/4 lengths more to 17-1 longest shot Cairenn third, while American Gal checked in last. Left: Lewis Bay in the winner's circle. 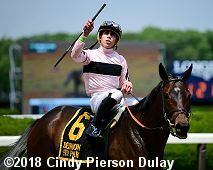 Winning jockey Irad Ortiz Jr. said, "I got a perfect trip. She broke good and got good position. I loved my post position. When I talked to Chad [Brown] before the race I told him I love the post because she's always breaking from the inside. She appreciated the outside post. Everything went perfect. I wasn't surprised to be close to the pace. We tried to take back the last couple times and she doesn't want to do that. She really finished today. It was good." Right: Lewis Bay returns after the race. 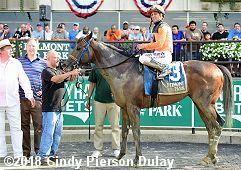 Winning trainer Chad Brown said, "She's had two hard races in Grade 1's where she's run very credible. Last time at Churchill, on that sealed track she came out of there with a quarter-crack in her right front foot. I'm not saying she would've won but it definitely was a legitimate injury coming out of there and it took her a while to recover and get it together. A lot of credit goes to Ian McKinley, he's my specialist to work on these situations and once again he did a fabulous job with repairing this filly's foot to get her back on the track as soon as he could. We breezed her a couple of times and she seemed to be ready to go back in the entry box. 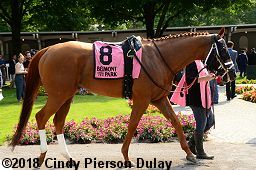 She's very fit and she loves Belmont." Left: Second place finisher Highway Star in the paddock. 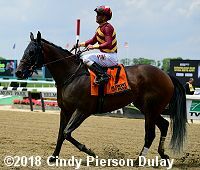 The Rodrigo Ubillo trainee improved her record to 8 wins, 5 seconds, and 2 thirds in 19 starts, earning $1,153,500 for owner-breeder Chester and Mary Broman. Right: Third place finisher Cairenn retuns after the race. 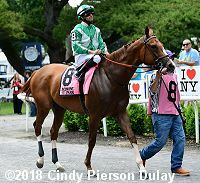 The Graham Motion trainee improved her record to 3 wins, 4 seconds, and 3 thirds in 11 starts, earning $159,860 for owners Heider Family Stables, Madaket Stables, and Michael Kisber. Last place finisher and beaten favorite American Gal crosses the finish. 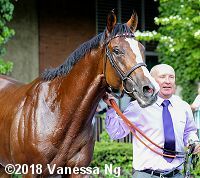 The Simon Callaghan trainee has a record of 5 wins, 1 second, and 1 third in 9 starts, earning $912,480 for owner-breeder Kaleem Shah Inc. The $150,000 Tremont Stakes featured 7 two-year-olds sprinting 5 1/2 furlongs, with the entire field coming off maiden wins. Jockey Manuel Franco sent 14-1 Social Fan to the lead through fractions of 22.38 and 45.73 while pressed by 2-1 favorite Mae Never No and 10-1 Our Braintrust. Entering the stretch Social Fan tired as Mae Never No inherited the front through 5/8 in 57.90. However Our Braintrust and jockey Javier Castellano came through on the inside to win by 3/4 length over late-running 7-1 Sombeyay in 1:04.41. It was another 3/4 length back to Mae Never No third. 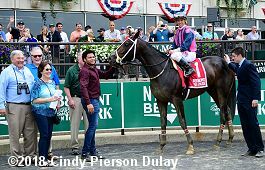 Winning jockey Javier Castellano said, "He was very professional. He broke well from the gate and got right behind the pace, right behind the horses. He got dirt in the face and waited for a seam. The seam inside opened, and I got to the spot. He's a very brave horse. You don't see too many young horses do that the way he did that. The way he finished, he's a nice horse." 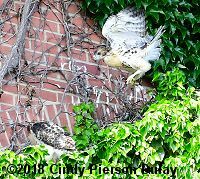 There was a nest with two baby hawks in the ivy above one of the windows on the back of the clubhouse end of the grandstand. They put on a show for us but still didn't seem ready to leave their nest on their first flight.